Note: Photos of ramp to be added shortly! Canvasworks Inc., in Minnesota, fabricates a large variety of items, many of which are for the outdoor Sportsman. Items include boat covers, duck blinds, dog kennels/ boxes and other things. Many products feature light weight aluminum and fabric construction. Owner Duane Smith is a retriever guy, so his products include several items for dog owners. One of these is the subject of this review – the dog ramp for cars, pickups and dog trucks. Historically, the use of dog ramps has been very rare. 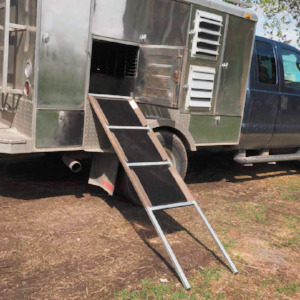 In the past, considerable use was made of dog steps which could be fitted to the kennel of topper rigs and chassis mounts. These helped the dog jump a little less high getting into trucks and a little less down when getting out. Occasionally, you would see a dog ramp being used but often it was for an injured dog, a dog undergoing rehab or a very old, no longer athletic dog. Otherwise, most dogs were simply taught to jump in or out of the trucks no matter the height. I recall vets and others talking about the preponderance of injuries (often shoulder) in working labs and suggesting it was due to all the truck jumping in and out. Then I began to hear about serious injuries occurring during the jump. Several dogs suffered ruptured cruciate ligaments as they jumped in. I personally experienced two such CCL ruptures with a dog. Most people tuned into this began to lift their dogs out of the kennels. A few started using ramps to help with the in and out. Frankly, most of these ramps were heavy and awkward. Some required unfolding so there was the hassle factor and usage was limited or often abandoned after awhile. I had seen one of the Canvasworks ramps a while back but hadn’t paid much attention. This past winter, I saw one up close and realized that this might be the answer. I got Duane to send me one and I have been testing it for over a month, as well as talking to other users. The number one feature is that dogs like it – more on that later. But equally important is that this thing is light – perhaps 8 pounds top. No folding is required and it can easily be carried in one hand. Because of its weight, it is easy to slide into a breezeway or the floor of a pickup box. 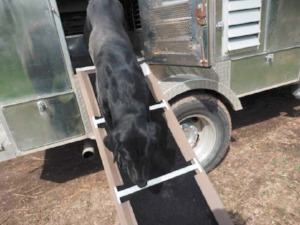 The unit simply leans on the edge of a standard truck dog kennel and the ground. There is no need for latching or securing. The ramp is constructed of aluminum tubing bars both length wise and cross ways. A piece of tightly stretched canvas supports the dog. On top of this is material like a rug that is soft but provides traction. The unit is welded and riveted and has several supports and trim fittings. It is strong and appears to be very durable. I talked to some users who had had it for over year and have used it thousands of times. Their units looked essentially new. My unit is 18.5” wide and 72” long. That is perfect for my chassis mount kennels – see the photos. Duane told me that people with toppers use the same model and, although it looks considerably steeper, the dogs easily climb in and can be easily controlled while coming out. He makes a 60” model for those using the tailgate of a pick-up or a car with a hatch back. You’ll notice the bottom portion is open and not covered with fabric. This is intentional as it helps the dogs line up and make the first steps up and, as well, it helps when using it in high grass or short brush. I noted above the importance of weight and portability. I knew I would not use it if it was heavy or awkward or annoying to operate. 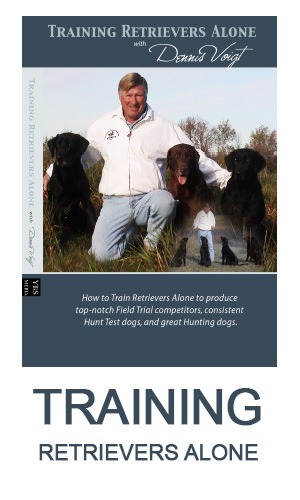 I have found it easy to use and, when training or at a trial, I just leave it out and one hand it from one dog kennel to the next. A small not strong person will have no problem two-handing it. The first two dogs I tried it with were 5 and 9 years old. The 5 year old went in and out the first time like he had being doing it all his life. The 9 year old was one of those dogs always clambering to get out and also a more difficult lift out. He too walked up and down easily with me just using hand signals to control rushing. Next, I tried a young dog who I purposely had never taught to jump into a kennel. I knew he was going to be a big dog and at 11 months he now was! For truck loading, I taught him to put his front paws on the kennel edge and to help me lift him in with a hoist when I said so. So naturally, when confronted with the ramp, he put his front paws up and waited for me to help him. I did so about 3 times as he learned to walk up the ramp. Then I simply signalled him and, voilà, we had a perfect up and down. He was actually the best of all. However, after about a month, he got the idea to jump from the halfway point so I had to teach him to get down a little slower and more deliberately. The last dog was a 3 year old who has always been inclined to rush. He always wanted to launch out or launch in with great zest. He certainly had no hesitancy to use the ladder but he did want to rush and perhaps miss a few steps and simply jump half way coming or going. He has gotten much better and I found that the bottom legs and opening when carefully used helped him enter more deliberately. So that’s four quite different dogs all handling it well. This ramp is a winner – it gets five stars. It is strong, durable, well-constructed and light weight. The dogs use it readily and properly with minor teaching. The most important thing is that you are doing your dogs a great service by protecting their joints and ligaments and muscles. If it helps prevent an injury, and I’m sure it will, it is worth many times its cost and use. Both the 60” and 75” ramps are the same price – $175USD. They can be shipped by FedEx for about $35 anywhere in the lower USA. 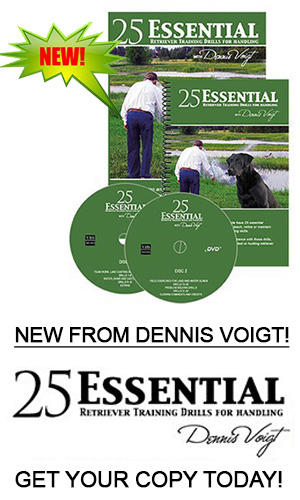 You can order from Duane Smith at 601 Nelson Blvd., Montrose MN 55363/ 763.675.2975. You can visit their website at: www.canvasworksincmn.com. You can also see them on Facebook, where there are more dog product pictures.